So often, Stewardship is seen as the annual financial campaign. As part of our ongoing stewardship series, we have been exploring the full expression of our covenant community with the commitments to support the ministries of our church with our prayers, our presence, our gifts, our service, and our witness. Our financial gifts are an important part of the full covenant. 7Be the best in this work of grace in the same way that you are the best in everything, such as faith, speech, knowledge, total commitment, and the love we inspired in you. 8I’m not giving an order, but by mentioning the commitment of others, I’m trying to prove the authenticity of your love also. 9You know the grace of our Lord Jesus Christ. Although he was rich, he became poor for our sakes, so that you could become rich through his poverty. 10I’m giving you my opinion about this. It’s to your advantage to do this, since you not only started to do it last year but you wanted to do it too. 11Now finish the job as well so that you finish it with as much enthusiasm as you started, given what you can afford. 12A gift is appreciated because of what a person can afford, not because of what that person can’t afford, if it’s apparent that it’s done willingly. 13It isn’t that we want others to have financial ease and you financial difficulties, but it’s a matter of equality. 14At the present moment, your surplus can fill their deficit so that in the future their surplus can fill your deficit. In this way there is equality. 15As it is written, The one who gathered more didn’t have too much, and the one who gathered less didn’t have too little. 6What I mean is this: the one who sows a small number of seeds will also reap a small crop, and the one who sows a generous amount of seeds will also reap a generous crop. 7Everyone should give whatever they have decided in their heart. They shouldn’t give with hesitation or because of pressure. God loves a cheerful giver. 8God has the power to provide you with more than enough of every kind of grace. That way, you will have everything you need always and in everything to provide more than enough for every kind of good work. 9As it is written, He scattered everywhere; he gave to the needy; his righteousness remains forever. 10The one who supplies seed for planting and bread for eating will supply and multiply your seed and will increase your crop, which is righteousness. 11You will be made rich in every way so that you can be generous in every way. Such generosity produces thanksgiving to God through us. 12Your ministry of this service to God’s people isn’t only fully meeting their needs but it is also multiplying in many expressions of thanksgiving to God. 13They will give honor to God for your obedience to your confession of Christ’s gospel. They will do this because this service provides evidence of your obedience, and because of your generosity in sharing with them and with everyone. 14They will also pray for you, and they will care deeply for you because of the outstanding grace that God has given to you. 15Thank God for his gift that words can’t describe! I invite you to consider your financial gifts to the ministries of Pacific Beach United Methodist Church, how your gifts make these ministries possible, and how a modest increase in giving can expand our ministries even further. 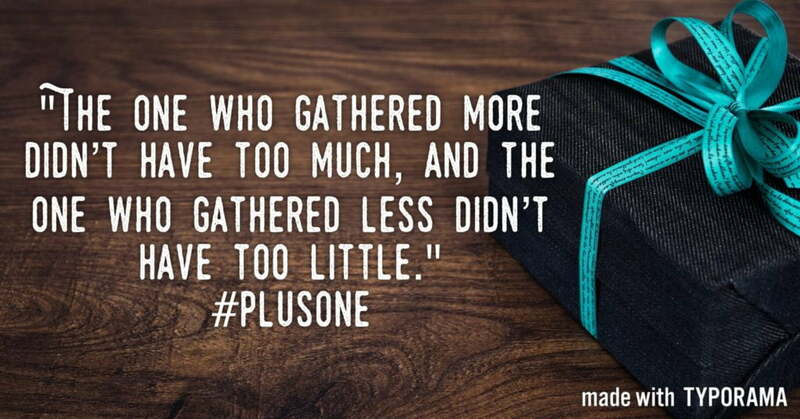 On Sunday we talked about some practical ways to #plusone our financial gifts to the church, and we considered this both practically and spiritually. Giving financially is a spiritual response to the ways God has transformed us, in the same way that giving our prayers, our presence, our service, and our witness. Now, a follow-up question: How do you see your financial gifts impacting our community of faith? How do you see your gifts impacting the neighborhood where we worship?